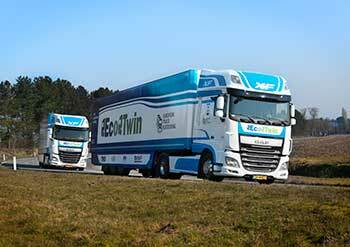 A consortium of DAF Trucks, TNO, NXP and Ricardo is uniting under the name EcoTwin to participate in the European Truck Platooning Challenge that is being organised by theDutch Ministry of Infrastructure and the Environment on Wednesday 6 April. The objective of the Challenge is to obtain permission from governments to perform large-scale, pan-European testing of truck combinations that are linked wirelessly (‘platoons’). This enables truck combinations to drive very close to each other, which presents benefits in terms of fuel consumption and therefore CO2 emissions, safety and the flow of traffic.